It’s been a busy year for the Byrum & Fisk team and we are grateful for all of the opportunities we’ve had in 2018 to make a difference in communities across the state. From running winning campaigns to helping our clients fight for a better, more sustainable Michigan, we are truly fortunate to have helped play a role in these important issues, efforts and campaigns. We want to thank our clients, colleagues, friends and families for supporting us and our work this year. Brief Word of Thanks: Thankful for my husband, our families and our adorable dog. Brief Word of Thanks: Grateful for healthy, intelligent kids that keep me on my toes. Brief Word of Thanks: I am thankful for my health and that of my family and friends. Brief Word of Thanks: I’m grateful for a little R&R after campaign season, my CrossFit gym and my friends, family and coworkers. Brief Word of Thanks: I’m thankful for my family and for our daughter Lauren who is on the path to healing. 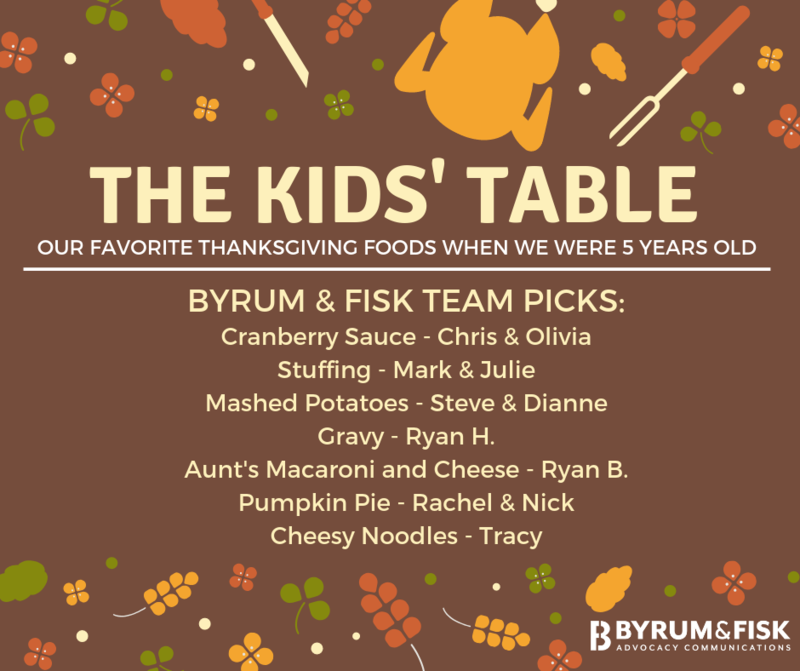 I’m also thankful for friends and my awesome colleagues at Byrum & Fisk. Brief Word of Thanks: I’m grateful for my wife and three daughters, strong core messages, Hazy IPAs and the best co-workers anyone could ask for. Brief Word of Thanks: I am grateful for the health of my family, which spans four generations and ranges in age from 94 to 8. Brief Word of Thanks: I am thankful for a healthy and loving family, warm home and a 50 pound puppy that serves dual purposes as a companion and alarm clock. Brief Word of Thanks: Thankful for time to slow down and enjoy a day with family. Favorite Thanksgiving Food When You Were Five: Stuffing! Favorite Thanksgiving Food as an Adult: Stuffing! Brief Word of Thanks: Thankful for my beautiful girlfriend, supportive family, rewarding job and fun work crew.